Is water leaking from the dishwasher in your Rancho Santa Margarita, California home? Appliances are not supposed to leak! If they do, certain steps should be taken immediately to avoid further damage to your house or place of business. First, turn off the appliance if it is still running. If you've got active flooding, turn off the water at its source immediately. Call your plumber or HVAC company to fix the problem that is causing the leaking, then call West Coast Restoration Inc to remove the water and dry your property. Drying out homes in Rancho Santa Margarita, whether from leaking ice makers, refrigerators, or water heaters, is what we do best. 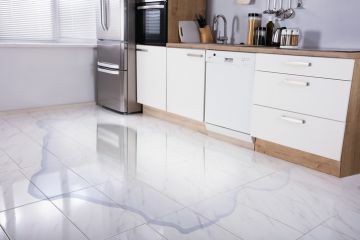 If you've got a leaking appliance in Rancho Santa Margarita, we've got a solution! Call (714) 584-4894! Water pooling on the floor around a water heater doesn't always mean that it's leaking. It might simply be condensation. However, if you see active dripping, spraying or notice that water is flooding from the heater, call your HVAC repair service technician right away. If your property has suffered water damage in Rancho Santa Margarita from an appliance leak, call West Coast Restoration Inc right away. Our crew will arrive in minutes to assess the damage that can be seen, as well as test for moisture lurking behind your walls and under floorboards. Sometimes, washing machines in Rancho Santa Margarita leak and water damage ensues. Whether the damage is contained on one level or the leak originated from the second story of a building, seeped into the flooring and down to the first level, West Coast Restoration Inc can help. We can even work with your insurance company so you won't have to. Call (714) 584-4894 if you are experiencing water damage due to an appliance leak in Rancho Santa Margarita now. Call your plumber for emergency services if needed, then call West Coast Restoration Inc to handle your water loss in Rancho Santa Margarita! We specialize in emergency dry out services in Rancho Santa Margarita. Our emergency dry-out response team will arrive within 45 minutes to assess the damage to your property and prevent further damage. Next, we'll extract all standing water and install high powered drying and dehumidification machines to remove moisture from flooring and behind walls. West Coast Restoration Inc technicians will remove all traces of water and moisture and prepare you for the process of reconstruction.